Over the past few years, there has been a gigantic growth in the percentage of Internet users who own tablets and other similar mobile gadgets. Nobody can deny such progress, because there would be no point in that! In order to make sure that we surf the web on the go from these devices without any problem whatsoever, it is crucial that the proper layer of security is accomplished. To be more specific, it goes without even questioning that you ought to keep the same level of safety to all the devices that you use for connecting to the web. If you take into consideration the fact that with mobile devices it is far more probable that you will end up using public Wi-Fi connections, you can see why it is so important to come up with the right kind of shield. A recent report by the joined forces of Kaspersky Lab and Interpol reveals that the threats of mobile devices are on the rise and that something needs to be done! This is what has urged us, being the Security Gladiators, to come up with the 5 best tablet security apps available within your reach. Let’s get started with their thorough description and evaluation, shall we? 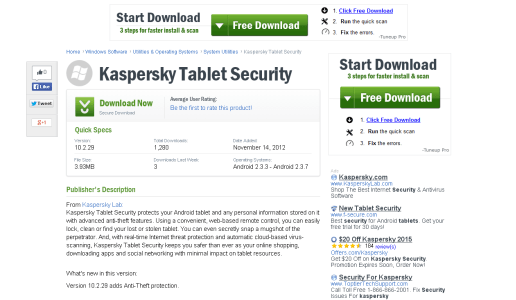 As a tribute to the company that has published the report mentioned just above regarding the emerging dangers of mobile devices when it comes to the web, we start our gathering of the best tablet security tools with Kaspersky Tablet Security. This is compatible with Android running tablets and it can take pride in offering anti-virus protection and proper web management. Of course, there is the ability to prevent theft and even locate your tablet, after it has been stolen. This is a feature that will definitely come in handy to tablet users! There is the cloud-based virus scan that can make a huge difference online, while another superb extra of Kaspersky Tablet Security is none other than the minimal impact required for downloading apps that are vital for the security of the device. Read our full Kaspersky Android Internet Security Review. Moving forward, we find Norton Tablet Security as a worthy opponent in the field of tablet security software. Of course, Norton is a well esteemed company and the security option that it provides could never be ignored. One of the marvellous features of this security alternative is the fact that you can get a sneak peak of the person who has stolen your tablet. This is by far the most advanced anti-theft protection available to this date! Apparently, this works along with the remote lock option and the immediate tracking of the exact location of the device. Finally, there is the ability to be notified of any suspicious website with this tool! Avast! 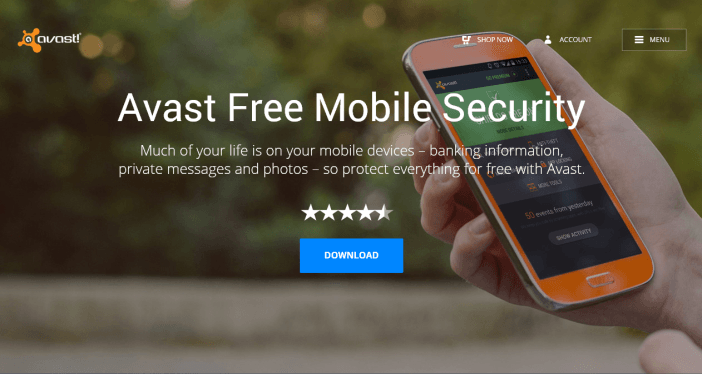 Free Mobile Security is suitable for both mobile phones and tablets running on Android. Here, we also find the option of taking a “theftie”, meaning the picture of the person who has taken your tablet! There are anti-virus options of premium quality that you can count on, as soon as you download and install this software from Avast. What is more, you will be pleased with the possibility that you have as to wipe clean the tablet from the very first moment when you realize that it is missing. You can choose between a free and a premium version of the security software, depending on the quality and severity of the features that you are interested in getting. 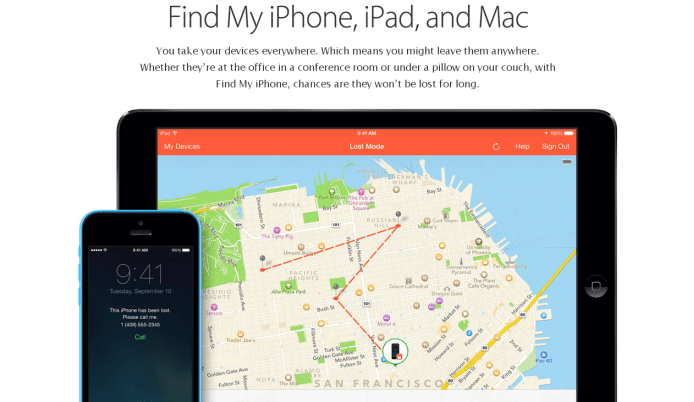 In case you have got an iPad or iPhone and Mac, there is nothing better than getting to use this cool option, called Find my iPhone. As soon as you realize that you do not have your tablet with you, this option offers you the opportunity to lock it down and display a message for whoever finds it. In this way, you can rest assured that the person who tracks your tablet will know how to contact you. If on the other hand the tablet of yours has fallen into the wrong hands, it is always better to wipe everything clean and avoid the stress regarding the information intercepted by people who are complete strangers to you. Nothing complex will put you off from setting up this tablet security alternative, without a doubt! We conclude the best tablet security apps with something slightly different than the previous options displayed to you. In specific, LastPass is a great tool that will help you out keep the passwords of yours in order and without any effort whatsoever. 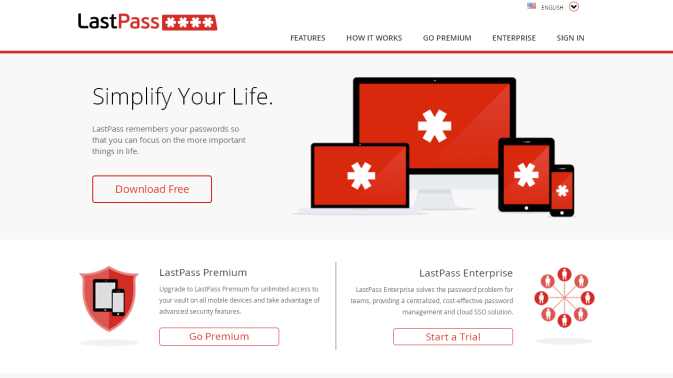 With LastPass, you will have the chance to activate complex and strong passwords that would otherwise be too difficult to memorize and remember. This allows you to enable two-factor authentication and thus it helps you maximize the security layer of your devices. In addition, there is the option of performing an audit for identifying the aspects of your online security that require improvement. Backing up and online records are also great benefits that you get with LastPass, as well as the remote access wherever you are! These are the very best tablet security system apps that are available for you to have your pick from. Make sure that you give them the opportunity to improve your overall online protection, in order to keep all the online threats at bay. Your tablet is a precious gadget that serves multiple purposes for you and so it is only fair that you treat it with the proper respect. Share your thoughts on the security quality standards of the various apps with us and let us know what you think!